Ancient Futures is marked about the place and appears to be the working title. Heard there was some filming going on in Hawley Woods, but haven’t been over that way recently. Anyway, latest Avengers flick has been filming there and set to move to Bourne Woods (of Gladiator & Robin Hood amongst others fame). Big bangs are expected. A great look at the typography of 2001, not only one of my favourite films of all time, but I also have long liked the fonts used throughout. Quite futuristic and yet clean. Many are in trend today. Just a promote for those Potter fans out there or in your life. A series of PDF guidebooks for fans available for a modest price that describe in detail the locations used to shoot the Potter films. As some may know I frequent Swinley a fair bit for mountain biking and got to see some goings on there for the films, hence a few posts here about it. Result has been I was asked to provide some assistance with some local information and a photo to the author of these books and the third book has some detail on Swinley (or actually as a supplement in more detail as for people looking to check out locations it’s going to be near impossible to identify the locations unless you know the place and saw where they shot the stuff, like me). Reading through, as a local one thing I didn’t know is very nearby to Swinley is Harry’s house (round by Martins Heron), or at least the original one. The locals asked too much to film there after that so Warner built a replica of the street on the studio backlot! A little credit in there too. Woohoo, name in print! of sorts :). A thanks to Chas for producing these books and the impressive efforts gone into to researching it. 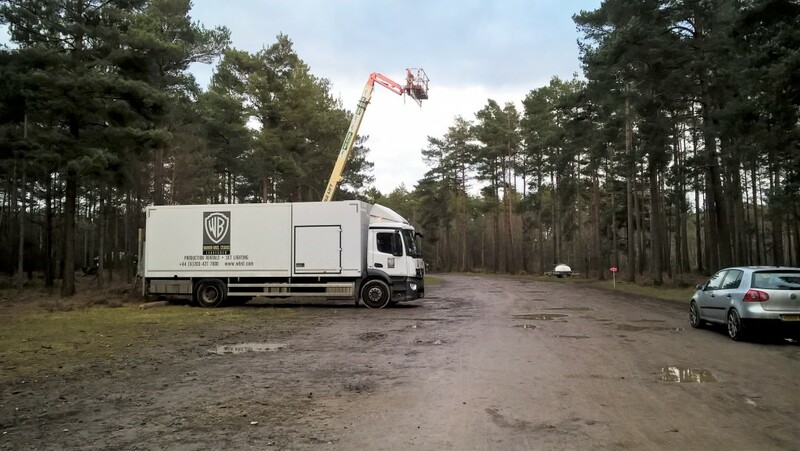 More filming in or near Swinley? + Surrey Hills? Location signs up on the roads approaching Swinley recently, saying (I think) ‘DBL‘. Haven’t seen any in Swinley or pointing into the estate, but at least directs down Nine Mile Ride towards The Look Out. Also, the other week, there was a sign on the junction of Shere Road where the A25 turns right up the hill towards Newlands Corner that simply said ‘BASE‘, pointing towards the hills. A typical base camp sign for a location. Didn’t have time to check it out. Update: Not sure if it’s related but further into the hills on the back roads towards Peaslake are signs up saying ‘MAYDAY‘.